The fund was established by friends and admirers of James R. Anthony (1922–2001), a leading twentieth-century figure among American scholars of French music in the seventeenth and eighteenth centuries. The James R. Anthony Fund supports the publication of studies, including critical editions, of French music from Beaujoyeulx to Rameau (ca. 1550–ca. 1760). At a time when French music studies were still recovering from the setbacks of the war, James R. Anthony undertook the daunting task of preparing a comprehensive study of French music from Beaujoyeulx to Rameau. French Baroque Music first appeared in 1973 and with the unfailing support of Louise Anthony was subsequently revised, expanded, and translated into French. That work helped to ignite a musicological sub-discipline for which Anthony would serve as the senior American figure. Indeed, his greatest role in musicology may have been that of benevolent mentor to a developing international team of scholars dedicated to the music he loved. A native of Rhode Island, Anthony had enrolled at the New England Conservatory in 1940 when war service interrupted his studies. He completed degrees at Columbia University, where he studied with Paul Henry Lang, and then took a diploma at the Sorbonne before completing a Ph.D. (1964) at the University of Southern California. He served on the faculty at the University of Arizona with distinction for forty years. In 1989 his colleagues presented him with a volume of essays, Jean-Baptiste Lully and the music of the French Baroque, in recognition of his 65th year. In 1995 he was named Chevalier de l’Ordre des Arts et des Lettres by the French Republic. The fund was established in 2007 at the initiative of a committee consisting of Antonia L. Banducci (University of Denver), Georgia Cowart (Case Western Reserve University), Bruce Gustafson (Franklin & Marshall College), Rebecca Harris-Warrick (Cornell University), John Hajdu Heyer, chair (University of Wisconsin–Whitewater), Lois Rosow (Ohio State University), and Carl B. Schmidt (Towson University). François de Médicis and Steven Huebner, Debussy's Resonance. University of Rochester Press. ISBN 9781580465250. Gurminder Kaur Bhogal, Claude Debussy’s 'Clair de Lune'. Oxford University Press. ISBN 9780190696061. 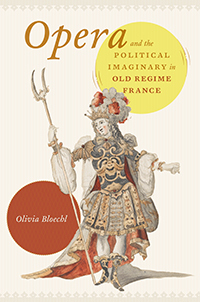 Olivia Bloechl, Opera and the Political Imaginary in Old Regime France. University of Chicago Press. ISBN 9780226522753. Rebecca Harris-Warrick, Dance and Drama in French Baroque Opera: A History. Cambridge University Press. ISBN 9781107137899. Georgia J. Cowart, The Triumph of Pleasure: Louis XIV & the Politics of Spectacle. University of Chicago Press, 2009. ISBN 978-0-226-11638-9. Proposals appropriate for the James R. Anthony Fund are accepted by the AMS Publications Committee regularly. See AMS Publication Subventions for further details. Contributions to the James R. Anthony Fund are warmly invited. Your support demonstrates an important commitment to the ideals and legacy of Jim.